Once a polymer has been identified, researchers can use one of several techniques to create the product. This method utilizes computer data to build products layer-by-layer, resulting in a carefully-designed, custom product. Rapid Prototyping (RP) is an umbrella term that describes multiple techniques including Extrusion-Based Bioprinting (EBB). EBB is a preferred method of bioprinting, in part because it allows for relatively high-density cell encapsulation. Extrusion-based multi-channel plotting is a related technique that builds with the x,y, and z-axis. Stereolithography is regarded as the oldest RP method. It uses photocurable resin polymers to manufacture objects, curing each layer before lifting the previous layer and allowing the resin to fill the space between the layers and the mold. The challenges involved in 3D bioprinting center around the physical limitations of the chosen inks. Researchers and technicians must consider the biocompatibility, resistance to shear, ease of engineering microchannels, and methods of crosslinking. Although the design capabilities of 3D printing are arguably advanced, the details of printed objects have been limited to macro and micro scales. Cellular activities require complex structures, substrates, and a narrow range of conditions to be carried out effectively. Therefore, research in recent years has focused partly on engineering more sophisticated scaffolds and tissue replacements to ensure cellular viability. However, some research suggests that, given the proper conditions and substrates, tissue regeneration will proceed according to its genetic instructions, regardless of the nanostructures provided. The exciting applications of 3D bioprinting in other medical fields often get the spotlight when it comes to recent developments. While tissue growth for pharmaceutical testing, replacement heart valves, and even entire organs are groundbreaking findings, the potential for flexible materials to be used for bone and cartilage regeneration is perhaps equally exciting. Although bone is a complex material to mimic, researchers have successfully engineered a vascularized hydrogel construct that promotes osteoblastic differentiation of mesenchymal stem cells. The cortical shell of normal bone is imitated by octacalcium phosphate (OCP) combined with gelatin methacrylate (GelMA). The internal ring of the construct mirrors the bone marrow space with human umbilical vein epithelial cells (HUVEC). A study in rats demonstrated a reduction in bone defect size 12 weeks after implantation with a biphasic scaffold. The scaffold was constructed with calcium phosphate cement paste and an alginate/gellan gum hydrogel, which encapsulated vascular endothelial growth factor. Other efforts have used porous ceramic to construct scaffolds that can be seeded with cells derived from the product's intended recipient. Researchers used a biocompatible hydroxyapatite powder to fabricate the scaffolds because of its association with efficient bone regeneration as well as its implantable quality. The end product can be made with inner channel walls on the order of 300 micrometers thick. Arthritis is a leading cause of disability in the US, making up 19% of work disability cases. The potential for cartilage regeneration technology to change lives is therefore immense. A major obstacle to creating viable cartilage tissue is the necessary balance between the material's ability to withstand stresses and its flexibility. This has resulted in experimentation with two main methods for bioprinting cartilage scaffolding: self-supporting hydrogel bioprinting and hybrid bioprinting. The latter provides additional strength by alternating layers of hydrogel with layers of thermoplastic polymer networks. 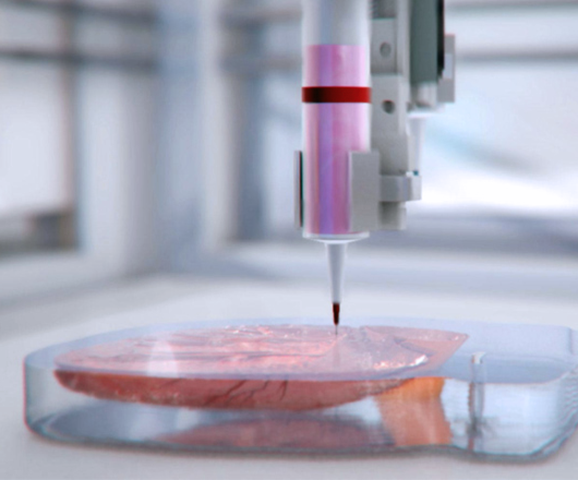 While hybrid bioprinting offers mechanical strength, it does require high temperatures during the printing process that can impair cell viability and may result in higher error rates. Some success has been achieved with a stereolithographic approach using gelatin and hyaluronic acid hydrogels. The authors of one study showed that their products could be adjusted for varying levels of differentiation and potentially used for the custom treatment of articulating cartilage defects. Biofabrication using flexible materials is an innovative approach to a myriad of biochemical, medical, and engineering problems. It has the potential to improve patient care with personalized, 3D printed products.